Find your way from there to here. 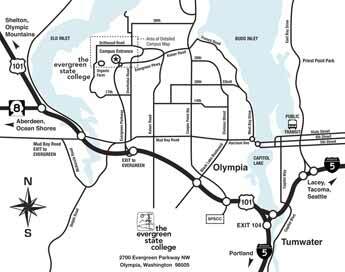 Get maps, driving directions, and transit options to our Olympia and Tacoma locations. Area map. Zoom in (PDF). Area Map and Detailed Campus Map (PDF)—includes driving directions and a detailed campus map. Detailed Campus Map—a detailed, printable map of the Evergreen Olympia campus. We are a one hour drive from Seattle-Tacoma International Airport. Olympia is also served by Greyhound and Trailways bus companies, Amtrak trains and local shuttle services. Intercity Transit bus routes connect Evergreen with other parts of Thurston County, Mason County, Grays Harbor County, Tacoma, and Seattle. Evergreen and the state capital are a short, scenic drive from most Western Washington cities and major points of interest. Take Interstate 5 to Olympia. Turn onto Highway 101 at Exit 104. Go west on 101 North for three miles. Take The Evergreen State College exit. 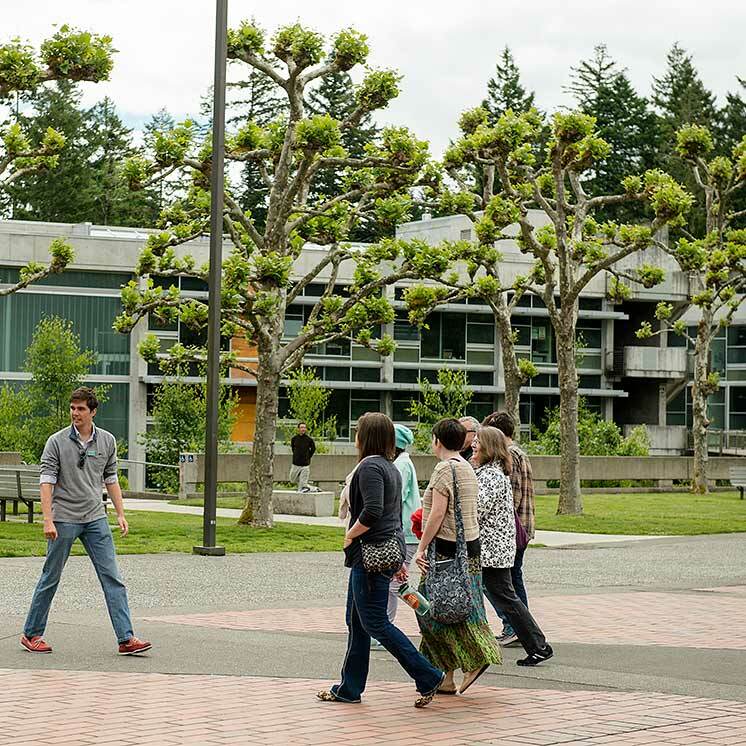 Go two miles north on the Evergreen Parkway to the main campus entrance (at the roundabout). Go east on Highway 101 North toward Olympia. Turn left at the stop sign onto 2nd Ave SW, which becomes Mud Bay Road. Follow the road's curve to the right and continue up the hill. At the hill's top, just beyond the overpass, turn left at The Evergreen State College exit. Go two miles north to the main campus entrance (at the roundabout). Visit the Evergreen Tacoma web pages for directions to the Tacoma location. Get information about parking at rates. We have several on-campus parking lots that will get you close to the places you need to be. Parking is enforced Monday through Friday, 7 am – 9 pm. Save money and improve the environment by greening your trips to class and work. Get information about getting to campus via bike, bus, carpool, or vanpool.